From Goodreads: Vika Andreyeva can summon the snow and turn ash into gold. Nikolai Karimov can see through walls and conjure bridges out of thin air. They are enchanters - the only two in Russia - and with the Ottoman Empire and the Kazakhs threatening, the Tsar needs a powerful enchanter by his side. And so he initiates the Crown’s Game, an ancient duel of magical skill - the greatest test an enchanter will ever know. The victor becomes the Imperial Enchanter and the Tsar’s most respected adviser. The defeated is sentenced to death. Raised on tiny Ovchinin Island her whole life, Vika is eager for the chance to show off her talent in the grand capital of Saint Petersburg. But can she kill another enchanter - even when his magic calls to her like nothing else ever has? 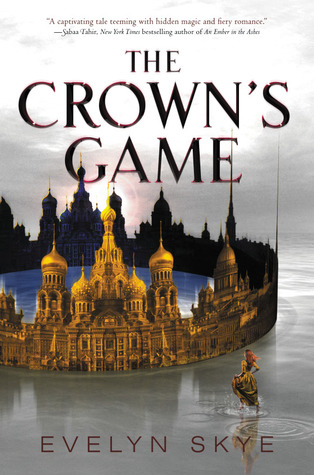 For Nikolai, an orphan, the Crown’s Game is the chance of a lifetime. But his deadly opponent is a force to be reckoned with - beautiful, whip smart, imaginative - and he can’t stop thinking about her. And when Pasha, Nikolai’s best friend and heir to the throne, also starts to fall for the mysterious enchantress, Nikolai must defeat the girl they both love ... or be killed himself. As long-buried secrets emerge, threatening the future of the empire, it becomes dangerously clear ... the Crown’s Game is not one to lose. Thoughts on the Novel: The Crown’s Game by Evelyn Skye was a book that I was really looking forward to reading because I thought it would involve two enchanters using magic to outduel, and possibly kill, each other. Unfortunately, my high expectations for this book were dashed as the plot mainly focused on romance, which involved both insta-love and a love triangle. Oh, and that magic … it’s pretty much only used to redecorate parts of Saint Petersburg. The characters were also not the best developed because I would frequently question their motivations and actions. Nikolai, for example, is an orphan who has had to fight to get whatever he wants. Why would he suddenly fall for a girl when the stakes involve death?! Despite all that, I managed to be entertained by The Crown’s Game until close to the end, where it appears that the losing enchanter hasn’t actually died. Perhaps it’s just me, but I seriously don’t get why authors take the easy way out and not kill a main character if they’re supposed to die! The Crown’s Game will be released by Balzer + Bray on May 17, 2016. Comments About the Cover: It’s so stunning! I love that your eye is immediately captured by the Church of Our Savior on the Spilled Blood (which is in the shape of a crown), and that you can see Vika running on water in the corner. In exchange for an honest review, this book was received from the publisher (Harpercollins) via Edelweiss. UGH insta-love and a love triangle?! Well, it looks I will have to lower my expectations for this one for these reasons alone. Sigh. I know it must do really well because it keeps occurring in books, but can we stop with the love triangles and insta-love? It works SOMETIMES, sure, but most of the time it ruins what could be a great book. Thanks for your thoughts. Sorry this one didn't work out. Hmm, now I'm curious about the ending but I resisted looking at the spoiler haha. I'm a little worried because I also have this one for review and I absolutely HATE when romance takes over the plot. Ack. This book held so much promise. So disappointing. Another one off my list.